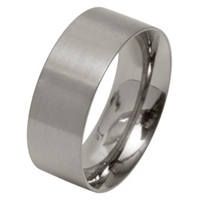 This masculine flat profiled Titanium ring has been designed with four grooved channels as the centre piece. Measuring 8mm wide, the ring is entirely finished with a high polish inside and out. The inside is slightly rounded for comfortable everyday wear.